Kilkenny will start 2018 without Colin Fennelly and Paul Murphy. 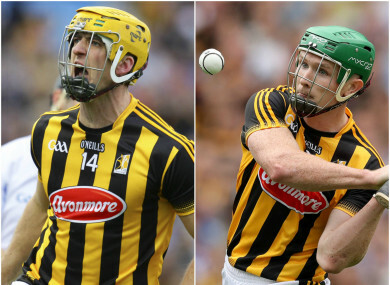 KILKENNY ARE SET to open 2018 without two of their most experienced, and All-Star-winning hurlers. After a disappointing season, Brian Cody will hope that his side can return to winning ways, but they’ll have to start out without the services of Paul Murphy and Colin Fennelly. The Kilkenny People are reporting that the Army has confirmed that both are due to travel on an overseas tour of duty to Lebanon in the coming weeks. Danesfort defender Murphy and Ballyhale Shamrocks sharpshooter Fennelly will return after six months, but a specific date has not yet been set. It’s believed they’ll be in Lebanon from October until April 2018, meaning they’ll miss Walsh Cup and the entire National League campaign. Both four-time All-Ireland winners, Murphy and Fennelly are members of 3rd Infantry Battalion, 1 Brigade, stationed at Stephens Barracks in Kilkenny. Murphy is a Corporal, while Fennelly is a Private. Last week, it was confirmed that Brian Cody would stay on as the Cats manager for a remarkable 20th season at the helm. The 63-year-old has guided his side to 11 All-Ireland titles, 15 Leinster crowns and eight national league successes since taking over in 1998. Selectors Michael Dempsey, James Mc Garry and Derek Lyng again make up the backroom team. Email “Kilkenny set to open 2018 and begin rebuilding without two All-Star hurlers”. Feedback on “Kilkenny set to open 2018 and begin rebuilding without two All-Star hurlers”.